What type of job/industry have you been in most of your life I’m only young!!!! Still starting life ….student (mechanical engineering). Retail. Your Motocross Highlights -2006 Sidecar Spectacular in Morgan, SA. Turning up with only spectating in mind, and end up swinging for the first time on a Kawasaki W1 pre 68 outfit, with Gary Sheppard. After one scorching hot day (40 degrees +) and one wet, windy day, ended up with an equal first to Murray Williams and Wayne Kerval (Norton BSA Special 500 pre 68). Most memorable (funny or painful) Motocross accident Most definitely memorable. Wokalup in 2009. Again an absolute mud pit with minimal vision attempting to continue swinging for Sarah whilst blinded by mud (not a good idea). Getting caught still sitting on the seat in a left hander with chair lifting and me falling off the side. The most memorable part was realising that I had landed in approx. a 3 feet deep natural spring. Was certainly clean by the end of it. Drowning was one risk of motorcycling I never signed up for. Luckily no injuries to myself or Sarah, only an aching jaw from laughing and smiling so much. 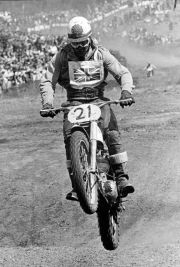 Family Motocross History – Grandad rode for many years in England around the 50’s. Trials and scrambles. – Sarah Dillon (sister) – my sidecar rider, solo rider on XL 390, or whatever she can get her hands on!! – Parents, Grandparents, Aunty – Race day officials from time to time. What are your favourite hobbies/interests outside of motocross – Working on, building and learning about the various vintage bikes. – General fiddling and building of various bits and pieces. What made you join VMXWA Grandad started it!!! Growing out of Juniors at age 16 and not really wanting or looking forward to to joining the modern senior ranks. Grandad noticed the Wandering event in 2003 advertised in the paper and upon spectating we realised that VMX was going to be fun. Joining up in 2004 to the friendly family, relaxed atmosphere where all members are willing to help each other out. What else do we need to know?! My shed often referred to as “Robert’s Dodgy Brothers Engineering” – Thanks Sarah. I am also referred to by Sarah as her sandbag!!! !